FIIs were net sellers of equity on Tue. (Jan 29) but net buyers on the other four trading days. Their total net buying was worth a huge Rs 43.2 Billion. DIIs were net buyers of equity on the first three trading days, but net sellers on Thu. and Fri. (Jan 31 and Feb 1). Their total net selling was worth Rs 9.6 Billion, as per provisional figures. For the month of Jan ’19, FIIs were net buyers of equity worth Rs 1.3 Billion – thanks to massive buying worth Rs 30 Billion on the last day of the month. DIIs were net buyers of equity worth Rs 21.5 Billion. In a blow to government’s job creation claims, an official survey conducted by NSSO during Jul ’18 to Jun ’17 showed India’s unemployment rate was 6.1% – the highest since 1972-73. Spin doctors tried to downplay the findings by claiming the data was neither ‘approved’ nor ‘final’. The interim budget announced on Feb 1 was expected to be populist in an election year, and it was. Benefits were announced for farmers and the middle class – without explaining where the money for the benefits would come from. After receiving good support from its 200 day EMA during the first three trading days, the index bounced up on huge FII buying on Thu. and Fri. (Jan 31 and Feb 1). However, the index failed to overcome resistance from the Fibonacci retracement zone between 36140 (50%) and 36810 (61.8%). Daily technical indicators are turning bullish. 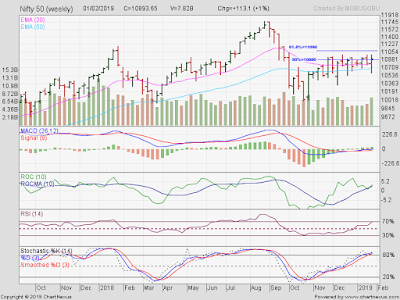 MACD is facing resistance from its signal line in bullish zone. ROC is trying to cross above its 10 day MA in neutral zone. 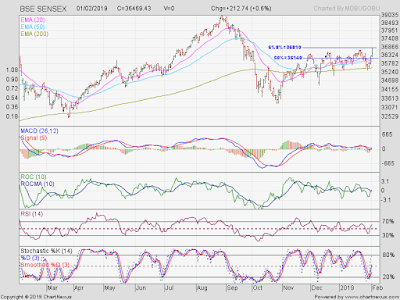 RSI has moved above its 50% level. 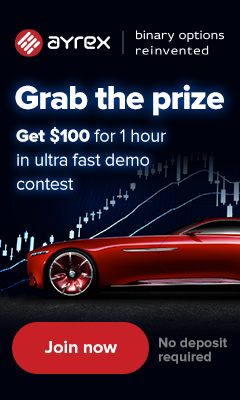 Slow stochastic is trying to do the same. All four technical indicators are showing negative divergences by touching lower tops. Bears can be expected to fight to defend the 36810 level. Uncertainty about the interim budget has dissipated. Focus should now shift back to corporate Q3 (Dec ’18) results – which so far have been nothing to write home about. For the past 10 weeks, the weekly bar chart pattern of Nifty has been facing strong resistance from the zone between 10880 and 11090 (which are the 50% and 61.8% Fibonacci retracement levels of the correction from the Aug ’18 top of 11760 to the Oct ’18 low of 10005). Last week’s heavy FII buying failed to propel the index much higher as DIIs used the opportunity to book profits. A convincing move above 11090 will restore control of the chart to bulls. A fall below 10680 (current level of the 50 week EMA) will be bearish. The battle lines are clearly drawn. Weekly technical indicators are looking neutral to bullish. MACD is moving sideways above its signal line in neutral zone. ROC is rising with its 10 week MA in bullish zone. RSI is poised to enter its overbought zone. Slow stochastic has entered its overbought zone. Nifty’s TTM P/E has moved up to 26.40, which is well above its long-term average in overbought zone. The breadth indicator NSE TRIN (not shown) is rising in neutral zone. Some correction or consolidation is likely. Bottomline? For the past 3 months, Sensex and Nifty charts have been retracing the sharp corrections during Sep-Oct ’18. Both indices are trading above their long-term moving averages in bull territories, but facing resistances from the zone between Fibonacci 50% and 61.8% retracement levels. Bulls and bears have fought each other to a standstill.